I had a minor dilemma this morning. And the day before as well. I had alot of music that I've uploaded to my (ftp) server and I wanted to bring it in to my anywhere.fm profile. 1) Download all my ftp music back to my hard drive, and then use the anywhere.fm uploader for the music that is back on my hard drive. 2) Emulate the ftp server as a mounted drive (in windows) and tell anywhere.fm to scan that mounted server. 3) option 3 is not very feasible because i would have had to install the last.fm uploader tool on the shared server which runs linux, that I have no authority to install programs on. but it could be a nice project if i were a genius with nothing better to do. 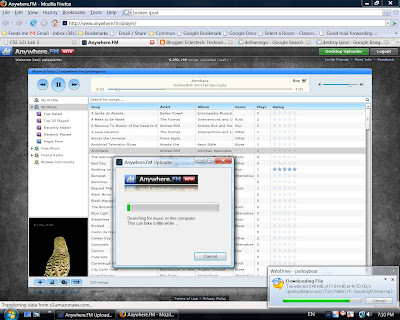 I chose to use WebDrive and emulate a w:\ as ftp.myserver.com and then use the anywhere.fm uploader to scan it for new tracks. There is a lot of file movement, but I'll update this when it works.. or even if it didn't work.